Stop on out - stroll through the orchards. It’s great fun for family and friends! Come on out to Littletree for a unique hands on experience. Bring a picnic. Stop in at Littletree’s apple barn and say Hi. We’ll give you a map, direct you to the best picking for the day, and show you where the picnic tables are. Play ping pong in the barn, wander around through the trees, pick a little here, taste a little there. 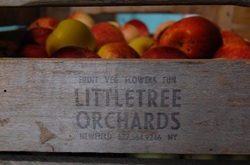 Whether you pick a little or a lot, a few apples or a few bushels of apples, meet your friends, have a birthday party, start or continue a family / friend tradition of an outing to Littletree. Sweet Cherries*- Ripening in late June or early July. Tart Cherries*- Mid-July thru mid-August. The flower patch is packed with a selection of both fresh and everlasting flowers. Many are finding it adds greatly to special occasions to pick their own flowers. You too can experience the pleasure and satisfaction that comes from picking your own flowers. Fresh and everlasting flowers await you! Julypink- Soft, sweet and juicy. Jerseymac- Flesh is crisp and juicy with a tart flavor. Discovery-An early eating apple with a long shelf life for its type, also makes a good sauce, excellent flavor. Paulared-Good for fresh eating, pies and sauce. It has a tart flavor and keeps well. Tydeman’s Early- An all-purpose, sweet-tart early McIntosh type apple, good flavor, medium firm, good eating. Burgundy- Outstanding sauce apple, deep red skin and tart, aromatic flesh. Jonamac- Excellent crisp dessert apple. Sweet and crisp. Akane- Small and pretty with exciting flavor, tart. Cox Orange- Outstanding distinctive flavor. Tart and aromatic. McIntosh- Crisp, juicy “water apple”. Very aromatic. Breaks down quickly when cooked. Pies, sauce, cider and fresh eating. Macoun- Mild, sweet flavor. Snappy crisp. Jonathan- Tart, firm, highly aromatic. Prized for pies, sauce and cider. Empire- A cross of McIntosh and Red Delicious. Crisp with excellent flavor. For fresh eating and everything else. Great for kids. 21 Yellow Varieties- Exotic flavors like banana and pineapple, with names like Hawaii. Starking Red Delicious- Very sweet and firm. For fresh eating. Golden Red Delicious- High in flavor and aroma. Sweet, firm and juicy. Good for fresh eating, cooking and cider. Roxbury Russet- Aromatic, dense flesh, sweet. *Northern Spy- Tangy, tart, firm, juicy and aromatic. For all uses. *Melrose- Well balanced sweet, tart flavors. For all uses. Baldwin- Aromatic, tart and firm. Excellent for cider. *Mutsu- Firm flesh is juicy and well flavored. For all uses. *Idared- Tangy and aromatic. Excellent for cooking and cider. Rome Beauty- Firm, fine grained flesh. Excellent for baked apples. *Golden Russet- The “Champagne” of apples. Sweet. Finding it hard to get to the orchad and pick your own? Join our Apple-A-Day CSA and pick up your share at the Ithaca Farmers Market on Saturdays. Send us a message with questions! and Like us on facebook for updates!